Miscellaneous | Toyota is known to be reliable and dependable. That isn't just because of a good design and high quality materials. It is also thanks to a special way of constructing. Toyota's approach to car making is known as "The Toyota Way" and comprises a way of designing, building and managing that unique for the brand. 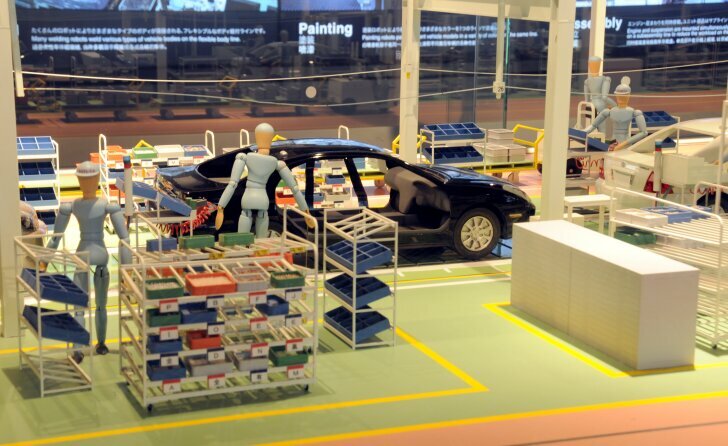 The best place to see "The Toyota Way" in action is in the plant in Japan. Toyota is the largest carmaker in Japan and that means everything is on a grand scale. Toyota doesn't own one factory, it has many around the globe. The main office isn't just one building, it is so many buildings that it dominates a whole city. That's why the city that was once known as "Koromo City" was named "Toyota City" in 1959. Annually, some 116,000 people get to know Toyota's products in the visitors centre. They are greeted by a trumpet-playing robot. Rest assured, it is just a gimmick. At the vistors centre all products are shown, from unicycles to lorries, but Toyota does not sell robots. Besides the entire range of products, Toyota provides a look behind the scenes. For example, the history of the Prius is shown ,including some early prototypes. The "Experimental Safety Vehicles" show how Toyota has improved safety over the last decade. Still, abstract ideas and concepts are the most important subject. In many cases a display isn't about a specific car, but about the philosophy behind it. A car isn't the purpose, it is the solution to a problem. It's not about money, but ensuring the future of the company is the goal. This different approach is what makes "The Toyota Way" unique. Once familiar with Toyota's products and philosophy, it is time to go to the bus; a Toyota of course. The drive through the city takes about half an houra The guide talks about the various buildings on the way. Just about every plant or office building seems to be connected to Toyota in some way or another. Because the buildings are close together, transporting goods is cheaper and less polluting. Today's destination is the "Takaoka Plant", where the Toyota Corolla, Auris and iQ are being built. And then a huge disappointment awaits: photography is prohibited. Even worse: only a very small part of the factory can be visited. Because Toyota has a unique way of working, its secret is closely guarded. In hindsight this is logical and understandable, but for a (photo)journalist this is a big setback. This is why the images accompanying this article were made in the visitors centre. Just like with any other brand, a Toyota starts with a huge roll of steel. Cut and stamped it produces about 5 km of metal. A giant press stamps this metal into parts like the bonnet, doors and chassis. Robots make some 4,000 welds to connect all the parts. The bare body now goes to the paintshop to be washed, coloured and protected against the elements. The actual factory visit takes place at the most interesting part of the process: assembly. Here the windows, cabin, engine, wheels and more are fitted so the metal frame becomes more and more like a car. And... in this department "The Toyota Way" is most prominently visible. The shop floor isn't sterile like with some other brands. 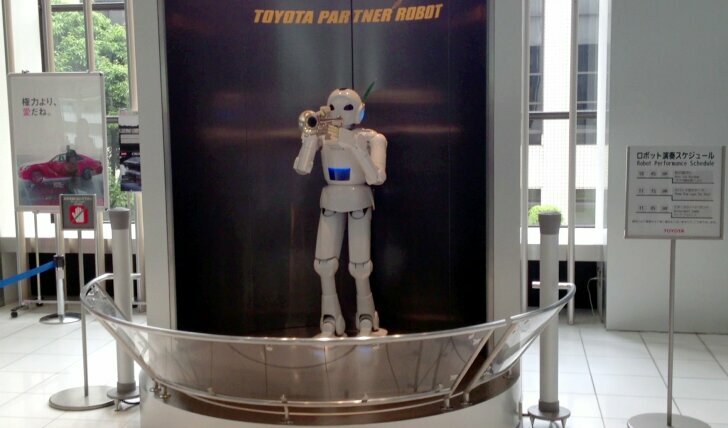 At Toyota it's not robots but humans who play the most important role. At first sight the production floor looks like a fish market; numerous trollies filled with coloured boxes move every which way. The narrow passageways between areas look like rabbit holes. Yet, there's an ingenious structure behind this. Toyota wants to eliminate waste of materials, movements and energy in whatever way possible. More space between departments, means a longer walk. Materials are delivered exactly when needed, in the amount needed to prevent unnecessary storage. Every next department acts like the customer of the previous one. This means that even during assembly the customer is already king. Japanese workers value customer satisfaction like no other nation, and in this way problems are eliminated before they reach the next department; and eventually the customer. Perhaps the most important component of The Toyota Way is asking workers to improve their own job ("Kaizen"). Everyone, from the manager to the receptionist, starts at the factory floor to get to know the process from start to finish. Everyone is required to make suggestions to make work easier, safer or more efficient. Examples of such improvements are tailor made tools, smarter logistics or ways to prevent mistakes. Physical health is key. Whenever possible, cars are being lifted or even rolled over to prevent having the worker bend or work in awkward positions. It is the sum of these many small improvements that in the end make a big difference. Therefore, visitors walk over a high rise balcony so they can see the cars progress but they cannot see the actual tools and gadgets from close up. However, some of the tools can be tried at special stations. Using a stopwatch visitors can try both the old way and "The Toyota Way" and experience how much faster the latter is. Building a car takes about 20 hours, most of which is taken up by the drying of the paint. On average, in the Takaoka plant, 800 cars are produced per day. After which the new vehicles are shipped all over the world from the nearby harbour. After some 3 months a new Toyota eventually reaches your local showroom. How is a Toyota built? 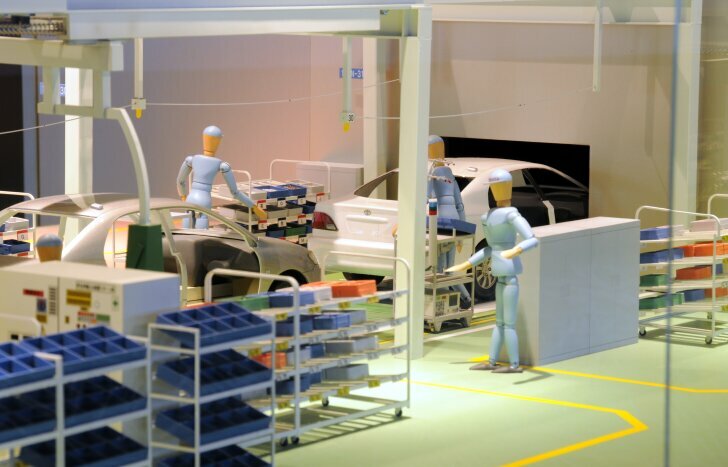 The best way to find out is by visiting the factory at "Toyota City" in Japan. Every year many thousands of people visit the Toyota plant, so tours are scheduled daily (in Japanese and English). The tour starts at a visitors centre where the philosophy and products of the brand are shown. The actual factory visit is brief (only 1 hour) and vague. To prevent competitors from copying The Toyota Way, visitors are kept at a distance. Understandable, but also disappointing because while most car plants look and operate the same, Toyota really has something to show. The "Toyota way" has evolved into a true philosophy which also includes management. The main goal is not to build as many cars as possible, but to make the best possible cars. The sublime experiences with Autozine's very own Toyota iQ prove that that philosophy certainly works!